Candidates for the Certified Estate Planner™ (CEP®) program must read and agree to the following terms and conditions (this page in its entirety) before enrolling. the qualifying examination has been successfully passed. APPLICATION & PAYMENT - The completed enrollment application must be accompanied by an enrollment fee in the amount of $1695 less any applicable discounts. The enrollment fee includes the cost of the course, materials, and exam. The CEP® enrollment fee, when paid at full price ($1695), also includes the certification renewal fee for the use of the CEP® certification in the first anniversary year. When the enrollment is discounted, payment of certification renewal fees will commence the next calendar quarter following the certification award date (see MAINTAINING A NICEP CERTIFICATION). Candidates may request an enrollment fee payment plan if necessary, however a substantial deposit will be required and no certification will awarded until full payment has been made. Unless other arrangements have been made, the entire enrollment fee is to be fully paid before any course materials are delivered and/or in advance of any participation in any course training provided online or in class. ENROLLMENT FEES ARE NON-REFUNDABLE - Before you enroll, understand that our proprietary course materials are delivered electronically within 24 hours of enrollment. Therefore, once an enrollment has been processed there shall be no refund of any enrollment fees paid. You have been convicted of any felony or business-related misdemeanor, or you are currently named as a defendant, respondent, or party to any such criminal or civil action. You have been or you are currently a defendant or respondent to a consumer complaint or allegation. You have had a state or federally regulated license revoked, restricted, or terminated for cause, including being denied or enjoined from selling or dealing in securities or from functioning as an Investment Advisor. You have been or you are currently the subject of an investigation, inquiry, or complaint by a state or federal regulatory agency, or any other agency, alleging violations of ethical conduct, prohibited sales practice, or breach of professional standards. Any material misrepresentation of facts or information given in the enrollment application or subsequent application for renewal will be cause for denial or immediate revocation of any NICEP certification and all its privileges, without refund of any dues or fees paid. EDUCATIONAL COMPONENT - The course content is delivered through a combination of self study and attorney led instruction. The self study manual is composed of 770+ pages broken down into eight topical modules plus appendix materials, and provided in PDF format via hyperlink. The attorney led instruction covers course highlights and practical application, and is conducted via four live interactive online sessions referred to as Online Plus Presentations, totaling 15-16 hours of PowerPoint, diagramming, case studies, and Q & A. Attendance in the live sessions is recommended but not mandatory, and the sessions are recorded and available for review in case of scheduling conflicts. Candidates spend an average 5 - 6 months of combined study and preparation of the above before sitting for the proctored qualifying examination. QUALIFYING EXAMINATION - Successful completion of a NICEP certification program requires that each candidate score a minimum of 70% on a proctored closed book examination. The qualifying exam is very challenging, worded in such a way that the student must have a competent grasp of the subject matter. When necessary there is a $10 retest fee. No qualifying exam shall be given more than three times. Candidates have one year from their enrollment to complete the program. Submission of a certification renewal fee of either a) $235 annually, or b) $49/quarter by automatic recurring quarterly debit/charge. Fees are reduced for the quarterly subscription as an incentive to elect that option. Automatic recurring billing subscriptions have substantially proven to provide against unintended certification lapsing, and the lower fees are only available with the quarterly automatic recurring subscription. New CEP® Graduates – If enrollment was paid at full price ($1695) the annual fee for the use of the CEP® certification in the first anniversary year is included. If enrollment fee is discounted, payment of certification fees will commence the next calendar quarter following the certification award date. Completion of the NICEP continuing education requirement of a minimum of eight (8) hours every two (2) years in the area of estate planning. Adherence to the NICEP professional code of ethics which requires model business behavior, compliance with State and Federal licensing authorities, compliance with represented professional companies and organizations, proper notification procedures, and submission to the findings and rulings of the NICEP with regard to the continued use of any certification which is conferred by the NICEP. The NICEP reserves the right to deny, suspend, or revoke the use its trademarked CEP® and/or MCEP® certifications for any reason. Certificants not in good standing with the NICEP may not display or otherwise use in any way a NICEP certification, certificate, logo, or associated material. 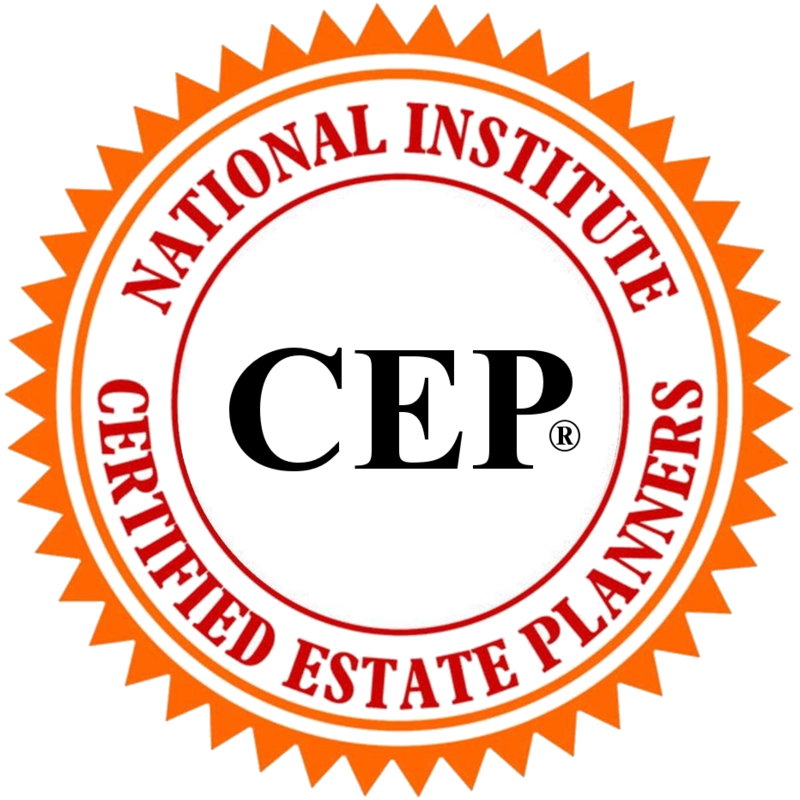 The Certified Estate Planner™ (CEP®) certification, in all forms and logos, is a trademark registered with the Unites States Patent and Trademark Office and is owned and conveyed solely by the National Institute of Certified Estate Planners (NICEP), Inc. This mark is awarded to individuals who successfully complete the NICEP certification requirements and who also comply with the NICEP annual maintenance requirements. The course materials presented in the Certified Estate Planner™ program are owned and copy-written by the NICEP, and may not be copied, loaned, or reproduced in any fashion without the expressed written permission of the NICEP, and then only for personal business applications. The information presented in the course is intended to educate the applicant to the various issues, possible problems, and creative solutions that exist in estate planning. It is not presented for the purpose of giving financial, legal or tax advice, and no one should take any action upon anything contained in the materials until they first discuss their individual fact situation with an attorney licensed in their state who is in good standing with their state’s Supreme Court and who is knowledgeable of their state’s law.